Today, I’m thrilled to have John Li on the show. John is someone who I met through Dave Lu, who I had on the show back in episode 19. Originally, I had only planned to have a short coffee break with John but we ended up chatting for close to 3 hours about family, business and life. One of the things I like about the Bay Area is that there seems to be an endless stream of awesome entrepreneurs to meet and John is no exception. 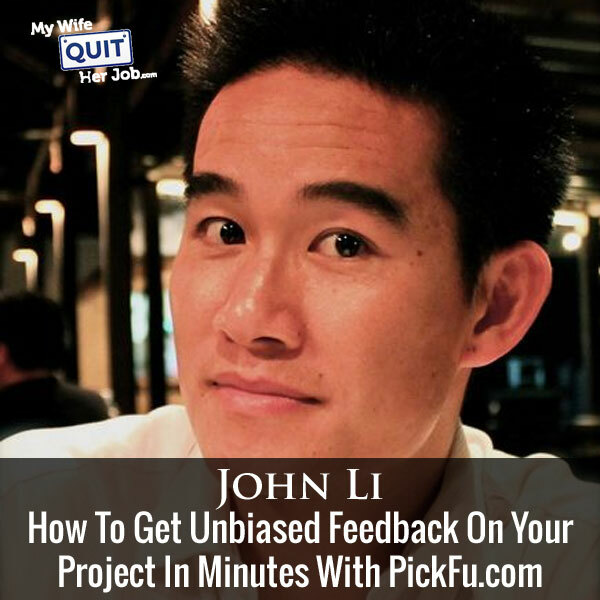 John and his partner created PickFu.com, a site that allows you to easily get massive unbiased feedback about anything in a matter minutes. What’s also cool is that John and his buddy coded up the whole thing in a week and the idea was profitable right away. In fact, John is the perfect example of how starting a business doesn’t have to be risky or expensive. John is offering a 50% off coupon to anyone who wants to try the service too. Please reference coupon code: MYWIFEQUIT to redeem the discount. Now if you enjoy this podcast please leave me a review on iTunes, and if you want to learn how to start your own online business be sure to sign up for my free six-day mini course, where I show you how my wife and I managed to make over 100k in profit in our first year of business. Go to www.mywifequitherjob.com, sign up right there on the front page, and I’ll send you the free mini course right away via email, now onto the show. Steve: Welcome to the My Wife Quit Her Job podcast, today I’m thrilled to have John Li on the show. Now John is someone who I met through Dave Lu who I had on the show back in episode 19. And originally when I met up with John I had only planned to have a short coffee break with him. But we ended up chatting for close to three hours I think about family, business, and life. And one of the things I really like about the Bay area where I live is that there seems to be an endless stream of awesome entrepreneurs to meet and John is no exception. So he and his buddy started out by creating a site called Menuism which is a cloud source site for restaurant reviews, which has done incredibly well. But I actually brought John on the show to talk about his other business PickFu.com. Now here is what’s cool about PickFu, John and his buddy pretty much coded the whole thing up in a holiday weekend, and the idea was so cool that it was profitable right away. Now we’ll get into how much John invested in PickFu to start his venture, but let’s just say that his business cost very little to create, and it was a hit right from the start. And John is the perfect example of how starting a business does not have to be risky or expensive. And with that welcome to the show John, how are you doing today man? John: Good, thanks for having me on Steve. Steve: Yes, so in my intro I didn’t explain what PickFu does, so if you wouldn’t mind just giving the quick one minute description of your service that would be great. John: Sure, so PickFu is a preference testing service where we bring the responders. And it’s a basically a tool for helping make better decision, it gets you really fast feedback. It will bring you 50 responders, you basically create a poll with two options, and it will bring you 50 responders within 10 minutes. So our responders will vote answering your question, which option is better, and they’ll tell you why as well. You not only get the quantitative but also some qualitative feedback as well. Steve: Yes, so let’s say I want to design — let’s say I was releasing a book and I had two covers, I would use PickFu to get audience feedback and which cover they like the best, right? John: Exactly, yes, and a lot of times those authors would use the responses as well to iterate on book covers in case if it wasn’t something that they were satisfied with. Steve: Yes, so I’m just curious, how did you come up with the idea of for even doing this, like what’s the back story? John: Yes, a couple of years back my co-founder Justin and I we had started that site Menuism. And both of us are developers by training, we were working with designers and stuff, but given that it was a founding team of two, we always had debates about what should this icon look like? What logo looks better and what not. Back at the time I think that was around when Team Ferris also released his 4 Hour Work Week, talked about testing his book titles with the AdWords. And Amazon released their Mechanical Turk API, and so one weekend we just decided to build this tool for ourselves. Basically we wanted to build a tool that could help us resolve our own debates and then bring some external opinions, and besides just the two of us arguing back and forth about which option was better. Steve: Were you guys arguing about like website design or graphics or what? John: Yeah, we were arguing about website design, graphics and it was just the two of us, so it’s — and we are equal partners but it’s not like I can — anyone can pull a rank over the other right? And each of us had our own preference; I think we were changing our logo for Menuism at the time. And we figured, well why not build something that can get a lot of external opinions really fast, and that can settle the debates. Steve: So I’m just curious when you guys were having these debates, like what sort of questions were you asking these users. John: So we would ask these users for example which logo is more attractive, or which logo looks better for a restaurant review website? Which logo would make you want to click through and find out more about the website, questions like that. Steve: And how big of a sample size would you typically use to kind of give yourself confidence? John: So the sample size of our panel is about — it’s in the tens of thousands. We set up the polls to be 50 responses, figured 50 is a good number — it’s a good balance of getting responses back really quickly, but also having enough responses where you could kind of see a clear winner. Steve: Okay, and what do you consider like a clear winner? So out of 50 let’s say there was like 30 versus 20, is that…? John: Generally that’s a pretty clear winner to us, I mean we definitely have seen cases where we’ve done things — we’ve gotten results as skewed as 45 to 5. And I mean if you get a result like that you kind of know which one is definitely better. We are actually working on features right now to help do more analysis on those results as well for statistical significance and stuff. Steve: So I’m just curious before we get into some of the nuts and bolts like how does — how do you guys actually get the people to take these surveys, like where do you find these people? John: So we built the service on top of a platform called Mechanical Turk, it’s run by Amazon. And it’s basically a market place for work, so you can provide small jobs for people. And then in our case the jobs we provide is to answer these polls that we are creating or that our customers are creating. Steve: Okay, I actually went on the site before this interview, it looks like it was designed in like the 90s right? John: Yeah, I think it was yeah. Steve: So I guess they have some sort of software, API that you can go in and then post stuff automatically and get results? John: Right, so the Mechanical Turk site is actually really difficult to use if you are using the web. But they do have a software backend where you can connect and write your own software to use it. And that’s what we did to build PickFu to begin with. Steve: So you post like a job for some of these people, and how can you guarantee that you are going to get enough results to actually fulfill the polls? John: So it’s a really large pull of workers on Mechanical Turk at any given time. And with these jobs you also host — you also post the payment. So basically you offer a certain amount of money for these responders to come do your work. Answering our polls is one thing, but a lot of other companies use Mechanical Turk for transcription services, translation, all of that stuff. And it’s basically just a market place, and if you offer enough of an incentive then people will come and respond very quickly. Steve: Okay and I was just curious what the going rate is, so you are having them come on, look at two things — is it just two things typically or is it? John: Yeah, we kept it to two things. People request, have requested for multiple choice often times they’ll run around Robin [ph] poll, like multiple polls. We want to keep it as simple as possible and as easy as possible for our responders. Steve: Okay, so these people come in, you ask them a bunch of questions and look between two options. Like how much do you pay someone? How did you know how much to set the rate for? Steve: So these people on — because I have never used the service before, I’m just curious. So this is a huge pool of people just willing to do small task for like a dollar here, a dollar there? Steve: I see, so let’s say I wanted, let’s say I was writing a book on parenting, would there be a way for me to just get people with kids to give an evaluation? John: Actually yes, so when we first created the product, it was asking anyone and everyone. And what we do is we do get the demographic information of the responders. So when you get poll results you do see the breakdown of males preferred option A over B, how many college educated responders preferred B over A, and what not. That was the case for a while, but recently we added the ability to also target those demographic segments. So yeah, we actually do ask family size, and number of kids in the household. So if you wanted to run a poll where you targeted only parents, we can definitely do that for you. Steve: I see and this is all stuff that’s kind of — that you’ve built on top of like this Amazon Mechanical Turk API? John: Right, so this is our own layer of understanding the data on top of our list of responders. Steve: Okay and I imagine your software nicely corates all the data and everything and it presents it to you in a — easily in a way that you can easily make a decision right? John: Totally we give you — yeah, two columns list of all of the comments, which one won, all the demographic breakdowns on the same page. Steve: Yes, so what I find really cool is that you told me earlier that you kind of threw this up over a holiday weekend, so how much did you actually invest in getting this started, and what was involved in just putting up the first prototype? John: In terms of monetary investment it was really inexpensive, because we set it up on a small hosting service called Heroku which is really popular for developers to create really small one off websites, probably less than 100 bucks for the first month or so. It was just an investment of time. Both my co-founder and I have development backgrounds, so it was more of a fun weekend project. It was more of a fun exploration than anything else until I get it set up and running. Steve: And Heroku just handles all like the backend stuff and all the scalability right? John: Exactly, yeah, it’s a God sent. Steve: Can you actually just comment on Heroku versus like Amazon web services, versus Google’s platform real quick? John: Sure, so I think Amazon web service has been around the longest. It probably offers the most flexibility if you want to get really deep into the nuts and bolts of building your own services. Heroku is this amazing layer built — I think it was built on top of Amazon web services that just made it really focused on making it super user and developer friendly to get something up and running really quickly. Yeah, and then I know that Google’s came in later into the game and I think they are very focused on making things very user friendly as well. But for now Heroku is still kind of the most preferred choice among a lot of developers. Steve: Okay and then the fact that you used Heroku allowed you to throw this up in a weekend without really having to worry about any of the server side stuff, right? Steve: Okay, and then so at what point did you decide to turn this into a service? John: So actually PickFu was– it was mostly an internal tool for a number of years actually. We built it for ourselves; we did put a front end on it. We put it on Hacker News and just kind of let it sit for a while. And during this time we were running Menuism for the past couple of years. And we kept noticing that people would come in and purchase a poll on PickFu even though we were trying to do nothing to spread the word. John: I think we threw it on a PayPal button and yeah, and that’s all we did, we threw on via PayPal, create a poll, that’s it. Like nothing about sharing and not trying to get not trying to spread the word or anything. And over time we noticed people kept using it, and then we upped the price and people kept using it more. And eventually we noticed that there were a couple of customer segments that were built and — sorry. John: So we had these customer segments building up organically and we were like, hey there might be a business. And as we kept using it we kept adding features as well to make it more useful and valuable for us, and then we saw more customers using those too. So probably one or two years ago where we decided that we really wanted to get back into and turn this into a business. Steve: So it sounds like you built this a long time ago and you used it yourself for like a year and then you decide to slap a PayPal button on it? Steve: To really turn this into something, it was just a tool you built for yourself and it just happened to — you thought you just share it and see if anyone else wants to use it? John: Yeah, exactly like we just kind of put it out there and let it go on its own and it was mostly just for our use. Steve: So let’s talk about getting your early customers then, so you had to set up — you mentioned Hacker News, so how does that work? John: So Hacker News it’s probably one of the biggest news sources for people in the tech industry, people who submit articles and people who look them up and down basically. It’s kind of like Reddit. Steve: So did you — so was there anything any strategy involved doing that, you can’t just throw something up, you need people to upload it right away right? Steve: Okay, so how did you get him to use your service? John: I wish I could tell you, he just discovered us. Steve: Wait but you didn’t do any marketing, he just — I mean how does someone discover it? John: It probably was some kind of Google search early on. John: So I think that initial discovery was probably through organic searches. John: Yeah, it was like a one or two page site, I think we put some copy about AB and preference testing for logos, because that’s what we used it for. John: And then I guess he and other people were looking for a similar service, and so they probably discovered us and started using this. Steve: I see, okay, and then after that someone submitted to Hacker News, did it go viral at that point? John: No I wish it did, but — I wish I could say yes, but no a couple of other people had used it and I think that the service provided – they count value from the really fast feedback and they probably told — it kind of spread slowly through word of mouth initially. Steve: Okay, and then — so now obviously you are actually trying to push it, or you have been for the last couple of years right? So what are some of the things that you’ve been doing? John: We’ve been doing — we’ve been trying to do a lot more outreach to our customers who use it. Generally our — I mentioned that our customers have kind of segmented it into a couple of different verticals. So our most — our biggest customer — our biggest verticals are entrepreneurs using it for testing business ideas, business logos, websites and a lot of mobile game developers using it to test app icons and screen store app before publishing to the app stores. And we have a lot of self publishing authors that use it for testing book titles and book covers before they publish. Generally we try to do a lot about reaching to influencers into those spaces. We started doing some advertising recently, but we are still working on — we are still working and growing the marketing aspect of things. Steve: So it’s just two guys right still? John: It’s two of us full time and then we have a handful of part time contractors that are spread virtually. Steve: So how do you decide which way to outdo outreach first right, it’s only a handful of people that have seen it. So what have you been focusing on and what’s kind of worked out the best for your service? Steve: Sure of course, so give me an example. Say you are reaching out to a game company like how you do your outreach and what does the conversation sound like? Steve: Was this before you reached out to them or? John: Yeah, it was before we reached out to them, they kind of stumbled upon PickFu themselves. Steve: So it sounds like SEO was like your first foray basically, right? John: I guess so, yeah, you can say that SEO was probably the first driver of business to PickFu. And then from there it kind of — things have been spreading through word of mouth and just naturally. Steve: Okay, and so you took it — so it sounds like you got a couple of customers via word of mouth, and then you engaged with those customers? John: Right so then we engaged with those customers and we talked to — like for example for game companies we are trying to engage with the customers we work with, ask them who else in the industry we should be talking to who would find benefit from PickFu. We have been using LinkedIn ads to some benefit and — LinkedIn and Facebook ads to some success although it could still be a lot better to target people within the gaming company — within the gaming industries as well. And generally — yeah, go ahead. Steve: So I was just curios, so I imagine you have their email address when they sign up for PickFu. So did you just reach out to them? Like how did you know they were a gaming company, just based on what they were testing or? John: Yeah, just based on what they were testing, we could see that they were testing app icons, so we just reach out. And I think that’s one of the biggest lessons that we’ve learned along the way is that you can always learn so much from talking to your customers. And that’s not something that we initially started off doing as well as we’ve been doing, but I think that we’ve really taken that to heart is to just keep trying to talk to almost every customer that we get. Ask them how they found us; how they like the service, what can we improve on. And I think as long as we keep doing that, we are going to keep being able to improve the service to provide more value for our customers. Steve: Okay and so in terms of — so you are doing the leg work now to reach out to other people and you mentioned advertising. Just curious which advertising mediums have you tried and which ones have been the most effective for you? John: We’ve tried — let’s see, so we’ve tried AdWords, we’ve tried Facebook ads, we’ve tried LinkedIn ads and Twitter ads. And I think of those we found that Facebook and Twitter actually has led to the most engagement. Steve: Interesting, Twitter can you comment on how that works? John: Yeah, so I guess Twitter advertising thing is not something that people usually talk about, but their platforms actually pretty — it’s pretty flexible to reach large audiences. Because the Twitter ad platform allows you to target audiences based on interest, which a lot of the other platforms do, but they also allow you to target audiences based on followers of specific people or specific people on Twitter. So if you know that you have certain influencers within the space that you are trying to target, you can go on Twitter and say, hey I want to target all the followers of the Pope or something. And I want to be able to promote this message to them. So it’s a really nice way to target like segment and target really specifically within a vertical. Steve: Yeah, so what ends up happening then is your tweet gets pushed up all the way to the top. John: It gets pushed into the feeds of the people who are being targeted. And then Twitter will measure engagement based on whether the — click through, re-tweet or favorite your tweet basically. Steve: Okay and then what are some of the percentages that you get in terms of like click through rate, and what not compared to some of the other platforms? John: Oh, I don’t have those off the top of my head, but I definitely know that the engagement rate on Twitter– we’ve probably seen two to three X the performance on Twitter versus some of the things that we’ve been trying to do on AdWords. John: And that could just be us not being good at using AdWords of course, but it’s been pretty promising on Twitter. Steve: Because I would imagine the way you sue those platforms is tremendously different right? AdWords like you are targeting queries and what not, and then Twitter you are just trying to interrupt them right? John: And I think the thing I guess maybe it’s more specific for PickFu is that no one searches for PickFu and generally no one searches for book title testing, or app store optimization that much. Or it’s very difficult — or they are very expensive terms. So for us to get into the conversation on AdWords it’s a lot more expensive than for us to be able to send some promoted tweets, to people who are interested in book marketing or app marketing on Twitter. Steve: I see, so it’s funny though that you would rank it; I assume you are already ranking for a lot of stuff in Google organically, right? Steve: Okay, so let me just ask you this question John, let’s say you were going to start over again from scratch like from the very beginning and deliberately try to build this into a business, how would you start today knowing what you know? John: Knowing what I know, I would probably pick a single vertical or a single customer segment and try to target that one first, and actually to work with people in that segment to build the product to the best of their needs. Steve: Actually I had a couple of other questions too. How did you, like in order to find these verticals, obviously you have to have a target customer in mind. So how did you kind of determine that? Like what your ideal customer would look like? John: Well, you know how I mentioned that it was kind of a side project; it was on the backroom for a bit of time before we decided to come back to it. The target customers kind of determine, no shows themselves. Like, because the word of mouth through those segments. It turns out looking at the people who use our service now, it’s people who want—it’s basically anyone who needs to make a business decision and needs feedback, who doesn’t already have their own audience. Steve: So how do you find that out though when you have no customers? Pretend you’re starting over today again, how would you figure out who to start with? John: So if I was to go through it again to try and arrive at that conclusion, I’d probably be — I’d probably try to take the product out and talk to—basically come up with the whole bunch of hypothesis and try to find people in those different segments and show it to them, show them the product and say, would you use it and why and why not? And I think, that would — basically iterating on those hypothesis about, oh what if it’s business people who want to do this, or what if it’s people with products that are already launched or books that are already published. I think kind of just talk to people in those potential segments, and asking how much value they see in this product, that would help me kind of narrow down which segment of customers this, like PickFu would provide the most value to. Steve: Yeah, and you mentioned a whole bunch of different demographics for your customers. So I was just curious like when you are designing your landing page, I would imagine that you would want like a separate one targeting each type of customers so you can really horn in on those guys. So how do you guys have your current page set up to kind of target all the different guys? John: Yeah, so we definitely have different landing pages for the different segments. If you are an app developer and you land on our app targeted landing page, you are going to see examples of successful icon tests where one company chose their icons based on some PickFu polls. You are going to see samples and actual polls of different app store graphics and screen shots that people have chosen based on the PickFu polls. That’s a different value preposition than if you were an author and you landed on our book landing page where you are going to see how we have like a — we have an author who ended up on the new York times best seller list, and how he used to PickFu to choose his titles and covers and so on. Steve: And so how do you encourage — so want to get a little bit into your like pricing model. So do you guys just have like an a la carte system, or are you trying to turn this into more like a recurring billing type of platform? John: So we have both. We started off with just an a la carte system where a single poll is $20 to get 50 responses. And you can purchase more responses for a higher price. You can purchase, you can add on things like demographic targeting, and that all change the price as well. And then for, we also have a recurring system where if you are let’s say you are a like a creative agency or a web design firm and you have clients, and a lot of design agencies will use us on their client projects because they want to show their clients that the design they came up with is far better than the one that the client has currently. So if you are using it on a regular basis, then we do have plans where we’ll give you a recurring set of credits on a monthly basis, and discounts on a la carte polls. Steve: I see. So it’s not like an all you can eat package. They still — they just get a discounted rate on credits when they just buy in bulk like that. John: Right. They get a regular allotment of credits plus it’s a discounted rate on all other purchases as long as they are subscribed to the plan. Steve: So that’s interesting. So why not just have them buy a lump sum credit at a discount as opposed to — like what’s their incentive for choosing this recurring plan. John: There are certain features that we have enabled for some of those plans that we don’t haven’t enabled for the a la carte. We are still trying to figure out the right model for this. And towards what you just mentioned we actually also do allow lump sum purchase of bulk credits as well. But if you are on a plan, you get a discount on those as well. Steve: Interesting. Okay. So when you approach a customer, it almost seems a little confusing to me, so how do you present all these plans to them? John: Honestly it definitely is confusing. We are really trying to streamline it better. When we approach a customer, I feel like — I don’t think that we try to explain all the different plans. I think the main thing for a potential customer is just to try it out and see, as often times what happens is after you try one poll, either you’ll, either it’ll work for you, or it won’t. If it doesn’t, we don’t want you on a plan. We only want to provide value where it makes sense. And if it does work for you as a potential customer, then you are — we trust that you’ll figure out what plan and pricing scheme is going to be best for you. Steve: Okay, I would imagine your goal though is to establish some sort of recurring. You want people on recurring, right? Because then you don’t have to worry about them. Steve: So along those lines, then it’s for the people that are on your plans, and I’m not sure what the split is on your site, how do you kind of encourage those people to stay and come back. Is there anything special that you do? John: I wish I could say yes, but that’s a really good question. That’s actually something we are working on now is that, I would say that that’s one thing where we haven’t been great at is customer education. You know, right now, we are focused on marketing and trying to get the word out. But I know that customer education is one big part of that. We are definitely not where we want to be in terms of suggesting uses for PickFu. For example if you are using PickFu for a book title, we should be telling you how to use PickFu for your book covers, and so on and within each of those verticals. And so education is definitely something that we can be a lot better at in terms of getting people on the plans to stick around and continue to use the service. Steve: Yeah, and so that’s actually one of the things I want to talk about a little bit, because you probably have a bunch of success stories and what not. So I was just curious whether you had any sort of case studies that we could just talk about real quick, some real examples that use models of PickFu, they might just have handy. John: Sure. Let’s see. We have a couple of case studies. For example — the one of the things that people ask is always like, “Can we trust, can we trust the results of this.” We’ve definitely done, we’ve definitely done our own verifications of the results of PickFu polls versus using, trying to use the same thing with AdWords, and Facebook and the results definitely align in terms of bench marking. If option A on your app icon wins on PickFu, you can be pretty sure that it’s going to win on AdWords and it’s going to win on Facebook as well. We’ve had some pretty — for example recently we had a bestselling author. His name is [inaudible 0:33:42]. And this guy, he’s probably in his late 60s now. But I think he claims to be the first American to travel to every single country in the world, and he was writing a book about his travels. This guy, he is a character; I mean it takes a character to try to do all these travels in a lifetime. He found PickFu and he really enjoyed the concept of that it would bring unbiased feedback. He was working with a large publisher. I forgot if it’s Peppercorn or Penguin or what not. And the publisher had their own view of what his book title; his book cover should look like. He had his own view of what his book cover should look like. And it was his book and he was very opinionated. And so he kept using PickFu over and over and over again to test his own hand created copy and paste images, like home Photoshop made versus the publishers professional covers. Over and over the professional covers won every single time. So this was a case where the publisher was actually right. And it took using PickFu a lot to convince him to go with the publisher’s option, suggested options. Steve: I see, and again this is like the classic case of where you have people working together with one another, and you can’t really decide on a design to go with right? John: Right, exactly. The other case that comes to mind is a book marketing expert named Tim Grahl, and I think he kind of has written a very popular book on self publishing called The First 1000 Copies. And but that was a title that he hated. So it actually — but he believed in data, and so he ran round robin polls on PickFu including his favorite title options, and this option called the first thousand copies kept winning over and over and over again. So in the end he decided to go with it, and I think it’s done very well for him. Steve: Interesting. So this is actually — so how quickly does a poll come out, like once it’s posted? John: You’ll start seeing results in probably within 30 seconds to a minute. John: And you’ll get 50 results within ten minutes. So it’s really good for just starting a poll and taking a coffee break and you come back and you have your results. Steve: So one of the applications that just came up top of my head is if you are writing a blog post and you want to come up with a viral title, you could just put up these titles and you will get something within ten minutes? John: Totally. Yeah, you will get something within ten minutes. Steve: That is incredible. It sounds like this Amazon Mechanical Turk just has gobs and gobs of people. John: Yeah, ready to work. I know that people I’ve talked about using AdWords or Facebook as well to test these titles. We’ve tried that before in the past and PickFu was something we build because we felt that those other services were, they were really complicated to use basically. Steve: So how does one price your service, like how do you guys come up with the pricing? John: That’s a good question. Steve: It was an iterative process, it sounded like. John: It’s an iterative and ongoing process. We definitely want to make it accessible for anyone who has a decision that needs some feedback. Steve: But I see the tremendous value in what you are providing as well. So it should be priced appropriately, right? John: Right. That’s a tough question. I mean, I don’t think we have the answers now. If we price it too high, then you are going to drive away a lot of potential usage. Steve: Actually you know what, sorry let’s switch gears a little bit. I actually had a question that just popped into my head just like on the logistics and how you guys run your businesses. You have this site called Menuism, which is doing really well. Now you have PickFu but you only have two guys. So how do you kind of work on two businesses at once? You know what I’m saying. It’s almost like — like for me it’s hard too. John: Yeah because I know you are juggling a lot of different businesses or different aspects of your businesses as well. For us, we try to schedule our time around different strengths and focuses. Menuism is at a point — Menuism is a more mature business in the way that it’s run. And so now we don’t have to spend as much time maintaining the site and adding new things. It’s also completely different business from PickFu unlike, in terms of its nature. So we have to — we generally prioritize really heavily and try to schedule pretty hard about what are the things that we need to get done for both businesses. On a year by year or month by month basis, we’ll decide that our main focus is going to be this and this business and within this business, these are going to be our main prioritize to get done in this month or what not. Steve: Okay, yeah, that’s — and then your partner actually doesn’t even live in the area, right? So you guys work together remotely. John: Yeah, so we work together remotely, and we’ve been doing that for the past eight years, nine years. Steve: Okay and here’s another question from — it’s a selfish question actually because I want to do something similar to PickFu at some point in the future. If you were to again start all over again, like can you just kind of describe the process. When you guys are talking about designing PickFu, was it just like, “Hey let’s just throw this up and see what happens.” Or were you specifically looking at pin points with your business when you decided to start this or? John: Yeah. So the model that my co-founder Justin and I have had for how we work is that we’ve always wanted to build a portfolio of businesses. And throughout this time when we’ve been working together, we’ve tried — there’s Menuism, there’s PickFu, and there’s like ten other small projects that we’ve tried and completely failed on. Generally when we are considering a new business, we try to focus on the pin points that we have. And we’ll build a lot of small tools to solve pin points that we have, and then once we build those tools, we’ll say “Okay, well, how well does it solve our problem and then potentially how many other people out there have a problem that’s similar to this.” So that’s the second questions we ask. And then number three, if we realize that a lot of other people have the problem and that our tool can solve — our solution could solve it, then the next question is how interested will we really be in committing the time to turn this from a tool into an actual business. I think that last part has been something that we learned only through a lot of trial and error. Steve: It sounds like all the business after you know talking to you over coffee that one time, all your businesses start out with basically minimal upfront investment, right? Is that kind of part of your strategy as well? John: That’s always been part of our strategy is to, it doesn’t — especially nowadays with all the tools and education available out there, it doesn’t take a lot of money to start a business. Steve: Okay. Yeah, that’s interesting. So you would never think about getting funding or anything like that. John: I wouldn’t say never say never, but that’s never been a priority of ours. We enjoy having the control to be able to grow our businesses the way we want to. Steve: So to kind of summarize, it just sounds like you think of small problems where you can come up with solutions relatively quickly. I imagine Menuism did not cost that much either, right? Steve: Yeah besides time, yes. And then you just put something up, see if it gets a little bit of traction, and then decide whether you want to put more effort into it. Steve: And there’s no risks really other than your time, of course. John: Right. You can definitely try to start businesses with very little upfront risk. Steve: So let me ask you this question, let’s say you weren’t a coder, how would this whole thing have changed? John: So if we weren’t coders, then I see a lot of non-coders starting businesses as well and doing very successfully. And I think it’s still about taking things one step at a time and doing them in bite sized pieces. So if I wasn’t a coder, then and I came up with this idea for PickFu, then I could ran this idea by a whole bunch of other people who I know have had experience starting businesses, and try to validate the idea first before committing time and money to hiring developers to actually try to build out this type of product. Steve: What I was actually trying to get at was that, do you still do your own coding? Because it sounds like PickFu is at a point where you need to more focus on like the sales and marketing aspects. John: Right, we still do a large portion of the coding. We do have some part time contractors as well doing some of the coding. Steve: Okay, and do you do that because you enjoy the coding process or? John: Yeah we do. We enjoy the coding the process, we enjoy building things. But we also, part of the reason we started the businesses in the first place is that we enjoy learning. And so we do enjoy learning about all the different aspects of running a business, marketing, advertising, all of that stuff. Steve: Cool, hey thanks a lot. We’ve been chatting for quite a while and a lot of good stuff here because a lot of my questions are actually selfish questions. I want to do what you are doing. I think it’s really cool. John: I want to do what you are doing Steve. It’s really cool too. Steve: I mean the fact that you can just take an idea and just whip it up over like four or five days, and then turn it into something that’s awesome, just sounds very attractive to me. John: Yeah, it takes some time as well. Yeah, I mean we are pretty happy with where we are, and looking forward to growing everything. Steve: So John, where can people find you. I understand you have a coupon code for the listeners here. John: Yeah, so people can find PickFu at our website, PickFu.com. For anyone who wants to try it out, we have a coupon for your listeners. It’s — as they just enter the code, “mywifequit” for 50% off their first poll. Steve: Awesome. I know for myself, I’m going to actually try this for some of my next blog posts titles just see where it goes. I mean, I didn’t realize you can get results in ten minutes which is pretty cool. John: Yeah, totally. We would love to get any feedback, and I’m looking forward to you using it. Steve: Yeah, well hey John thanks for coming on the show man. Really appreciate your time. John: Cool thanks a lot for having me Steve. Steve: Hope you enjoyed that episode. I think a service like PickFu is perfect especially when you are testing a site that gets very little traffic. By soliciting feedback from a pool of people, you can get real opinions on your site in ten minutes as opposed to weeks or months with split testing. For more information about this episode, go to mywifequitherjob.com/episode96. And if you enjoyed this episode, please go to iTunes and leave me a review. It’s by far the best way to support the show and please tell your friends because the greatest compliment that you can give me is to write a referral to someone else, either in person or to share it on the web. Now if you are interested in starting your own online business, be sure to sign up for my free six day mini course where I show you how my wife and I managed to make over 100K in profit in our first year of business. Go to mywifequitherjob.com, sign up right there on the front page and I’ll send you the course right away. Thanks for listening. I checked out this site after reading one of your articles. Not sure if the business is abandoned but your promo code didn’t work, the site seemed to crash on every other page, and it doesn’t allow you to login. Owner/customer service seemed helpful, but no way I trust this. John from PickFu here. The business is definitely up and running, apologies for the server issue you encountered last night. All logins should be working, please check your spam folder for your account confirmation. I’ve personally looked into your account and confirmed it active for polling. You know how to reach me if you have any other questions, thanks!